Multilingual classrooms need a multifaceted approach. The number of K-12 students in Oregon who don’t speak English proficiently has grown —dramatically — over the last 20 years. Emergent bilingual students now make up 10 percent of the state’s K-12 student population. These students are learning English on top of their regular school subjects, yet many Oregon teachers don’t have the specialized training or certification to meet their needs. But that’s changing. Thanks to a new, 5-year, $2.5-million grant from the U.S. Department of Education to Oregon State’s College of Education, more Oregon teachers will soon be able to earn their English for Speakers of Other Languages (ESOL) endorsement without having to pay the $10,000 tuition. The grant will also help these teachers work with community resources to build bridges with families of emergent bilingual students. Known as TEAMS (Teachers Educating All Multilingual Students), the new program will train 80 teachers in the Beaverton, Bend-La Pine, Springfield, Greater Albany and Corvallis school districts to better understand the languages, families and community cultures of their students. For example, a Spanish-speaking student might spell the word coyote with two Ls instead of a Y because a double L in Spanish is pronounced the same as a Y in English. Knowing these linguistic nuances, a teacher can better help students understand errors. Two cohorts of 40 teachers each will complete six online courses through the College of Education over 18 months, culminating in the ESOL endorsement. The grant also includes funding for a facilitator in each district who will foster connections to local community organizations engaged in cultural understanding. The facilitators and district participants will collaborate with these organizations to co-design education-focused events that deepen a teacher’s ability to engage the parents and wider community of emergent bilingual students. If a class is studying a unit on plants, for example, and a teacher knows a student’s parents use plants in traditional healing, the teacher might invite the parents into the classroom to share how plants are used in that culture. 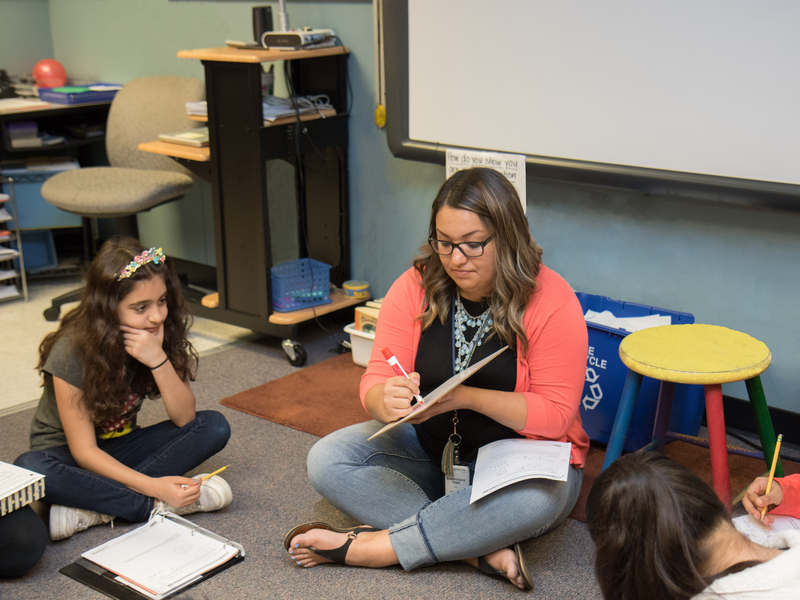 After earning their ESOL endorsements through Oregon State, these teachers will be poised to make a huge difference for emergent bilingual students. Oregon’s student population may be changing, but Oregon State’s commitment to education for all never will. 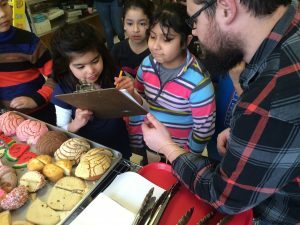 A fifth grade boy who hasn’t been engaged in science class suddenly perks up when the after-school lesson involves a visit to a local bakery where he gets to use a mortar and pestle to grind wheat berries into flour for bread making. It turns out the boy helps his Latina grandmother grind corn at his home. Instantly, science is connected to something he can relate to, and a light bulb blinks on. A third grade girl from the Dominican Republic visits a local tire shop where she gets to use shiny tools like pressure gauges and tire tread measuring devices, and a connection is made in her young mind that math is all around her and much more than the inky symbols printed on worksheets in a classroom. FIESTAS stands for Families Involved in Educational Sociocultural Teaching and STEM. As the name implies, it is about engaging students from diverse sociocultural backgrounds in STEM learning by involving their families and tapping local businesses to serve as real-world classrooms and hands-on labs. The experiences help students – and future teachers – see how STEM subjects are woven throughout local communities. FIESTAS is also demonstrating that successful STEM teaching depends on a wide range of factors that go well beyond the walls of any school classroom. FIESTAS started when Bottoms and Ciechanowski partnered with two 4-H after-school clubs and later the local Boys and Girls Club of Corvallis. Their goal was two-fold: 1) expose underserved youth to STEM related projects to increase interest in STEM, and 2) engage preservice teachers (PSTs) in culturally and linguistically diverse settings. Four years later, the program has grown exponentially and is benefitting students, parents, local businesses, and the 50-plus PSTs who work with students in two dual-immersion elementary schools each year. Part of what excites Ciechanowski and Bottoms is seeing how the kids – and the PSTs – connect with and learn from the local businesses. The PSTs meet briefly with the community partners ahead of time to frame the lessons and offer pedagogical expertise, like how to set up activities at stations for hands-on learning. By working with people in the local community who use math and science every day, the students see STEM integrated in everyday life, and not something separate. “We might not identify these individuals as scientists or mathematicians, but they are using science and math every day, so we help kids see that connection,” Bottoms says. FIESTAS also has a diversity component aimed at helping budding teachers experience first-hand how kids from different sociocultural backgroun ds learn in different ways. The program is intentionally targeted at schools with diverse student populations. This diversity is also connected to families, which is why FIESTAS reaches out to include the families of the students. The mother of a Fourth Grade girl told the researchers how her daughter, who ‘hated’ math and refused to do her homework, is now telling people she wants to be an engineer when she grows up. The mother credits the change to FIESTAS, which actively works to communicate with families and sometimes sends videos of the children engaged in the local lessons home with students so their parents can learn, too. FIESTAS also has a research component. In addition to the undergraduate PSTs, doctoral and master’s students are involved in data collection and analysis, and Bottoms and Ciechanowski have presented their findings at conferences and published in journals. “This is a community based research project,” says Ciechanowski. The researchers have learned that exposing students to STEM in their own community sparks interest and ignites passion, and that STEM learning works best when rooted in the sociocultural relevant contexts of children’s lives. The program is also helping develop teachers who have a deeper understanding of STEM teaching, diversity, community learning, and more. “We see from our own analysis of the PSTs who are part of FIESTAS that the experience is shifting their perspectives and making a difference in how they approach teaching,” Bottoms says. The program has been so successful and grown so fast that Bottoms and Ciechanowski are searching to find funding to hire a program coordinator and to support new doctoral students. They believe FIESTAS is so unique and successful that it could be replicated in other communities across the country. “We’re underfunded because FIESTAS is so unique that it doesn’t fit into a box,” Bottoms says. Although programs in other parts of the country include some of the “tentacles” of FIESTAS – activities like family math and science nights, no other program incorporates so many different threads or maintains such long-term connections with community partners, Ciechanowski says.